Last week, we learned that Fiat Chrysler Automobiles was opening up a new facility full of its heritage cars, where it mostly mentioned its Fiat, Lancia and Abarth models. Not in the press materials, however, were what appear to be two Alfa Romeo 4C Quadrifoglio cars that we may not have seen before. 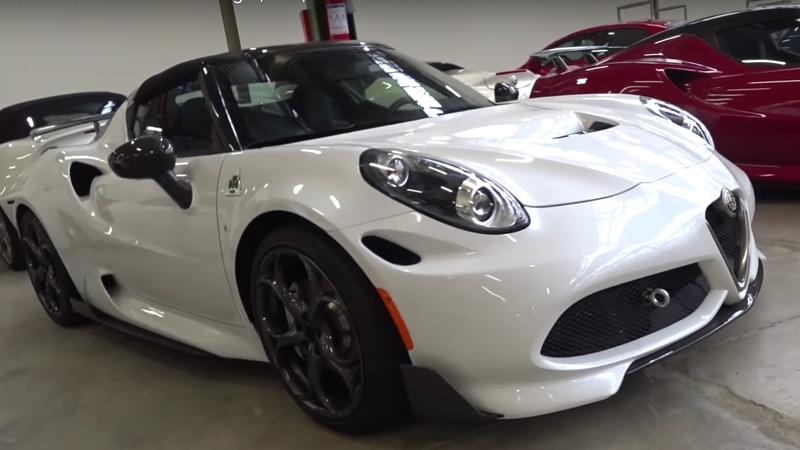 Back in 2014, then-CEO of Alfa Romeo Harald Wester teased that there was potential for an Alfa Romeo 4C with more performance, according to Car And Driver at the time. Then we seemingly never really saw that potential materialize into an actual car. A tip sent to Jalopnik led us to a TonaleForum.com thread discussing the video from YouTuber Masterpilot Emiliano Perucca Orfei, who took a tour of Alfa Romeo parent company FCA’s new Heritage HUB—a new home to hundreds of the conglomerate’s vintage production, prototype and race cars. The two cars seem to have some significant bodywork changes, including more aggressive front and rear carbon fiber splitter treatments, large adjustable rear-wings, a large opening in the hood that wasn’t featured on the production car, and additional openings in the front fenders next to the headlights, and in the rear just under the wing, which are likely for enhanced brake cooling if they’re functional. The biggest giveaway that these are Quadrifoglio cars is the four-leaf clover badges plopped between the front wheels and the doors, which are only on higher-performance Quadrifoglio Verde (QV) models. According to the former-CEO’s comments from 2014, a 4C QV prototype would likely include a modified version of the regular 4C’s turbocharged 1.75-liter four-cylinder engine, as well as a brake upgrade and the same or similar dual-clutch automatic gearbox. As for why it never made it to production, well, we don’t know. We’ve reached out to Alfa Romeo to confirm these cars are Quadrifoglio prototypes and asked why they never made it to production, and we’ll update when we have more information. It’s too bad, too. The aggressive bodywork looks fantastic.